President Obama has used basketball as a way to bond with the American people, but he has had ups and downs in making his NCAA tournament picks for the past eight years. On Tuesday, ESPN reporters Andy Katz and Rebecca Lobo paid a visit to the White House to renew for the last time the network’s annual tradition of collecting President Barack Obama’s NCAA tournament picks. During a half-hour session in the Map Room, Obama chose Kansas among the men, and UConn among the women, to win the final brackets of his presidency. “He was great as he always is,” says Lobo. “He seems to enjoy the break from the madness of the day.” And POTUS took the task as seriously as ever: Before the ESPN cameras rolled, an aide went back to the bracket boards three times to fiddle with this or that pick. Five months later Katz was at 1600 Pennsylvania Avenue when Obama picked up his Sharpie. That first year Obama took heat for ignoring the women’s bracket entirely. Soon gripes would surface from female White House staffers about a male-dominated work atmosphere that they felt shut them out of decision-making, and some of the complainants cited the president’s all-male pick-up games with aides as contributing to the exclusionary vibe. Since 2009 Obama has never failed to fill out a women’s bracket, first with ESPN’s Doris Burke and then with Lobo. 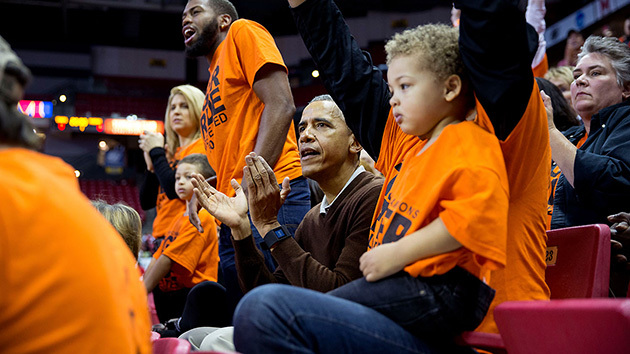 Elsewhere in his basketball life, Obama would settle comfortably into a role as Title IX dad—not just in supporting daughter Sasha, by jumping in to help coach her Montgomery County (Md.) youth league team, but also by lending support to his niece Leslie Robinson’s Princeton team during its unbeaten regular season a year ago. After having attended the Tigers’ NCAA first-round defeat of Wisconsin-Green Bay at Maryland’s Xfinity Center last year, the president will have another chance to cheer Leslie on: Though they failed to land the automatic bid that comes with a regular-season title, the Tigers did become the first Ivy League team, men’s or women’s, ever to land an at-large bid. POTUS is picking the Princeton women to upset West Virginia. In 2009 Nate Silver, the FiveThirtyEight.com data guru who occupies that sweet spot between sports and politics, used what he called “a logistic regression model” to demonstrate that Obama’s first Final Four picks in office had a swing-state bias. Obama occasionally confesses to rooting interests beyond the calculus of his picks—for instance, he has copped to bias in picking Leslie’s Tigers; and Harvard, where he went to law school and where his friend Marty Nesbitt’s son, Alex, played on the men’s team from 2011 to ‘15. But this year both the men’s and women’s fields feature the school with a longstanding claim on the president’s heart. When Obama was 10, his grandfather scored scarce tickets to watch the University of Hawaii's all-black "Fabulous Five" play. In his memoir Dreams from My Father Obama writes about the confident and winning starters on that 1971–72 team, with their bountiful Afros and privileged place in the community. Bob Nash, Jerome (Hook) Freeman and the rest of the Rainbows made a huge impression on one of the few African-American kids in the islands at the time. Hawaii had landed an NIT bid the previous season (still a coup in those days); in ’72, shortly after Obama saw his first UH game, the same nucleus of starters landed the school's first-ever NCAA bid. Having received a basketball as a Christmas gift from his father in December 1971—the last time he would ever see his dad—young Barry easily became hooked on the game as a fan and a player. The Hawaii men are making only their fourth NCAA appearance since Obama was a kid growing up in Oahu. With a deep playoff run from his favorite NBA team, the Chicago Bulls, looking less and less likely, Hawaii, which now goes by the Rainbow Warriors, may be Obama’s last, best hope for an in-his-blood postseason hoops moment while in the Oval Office. 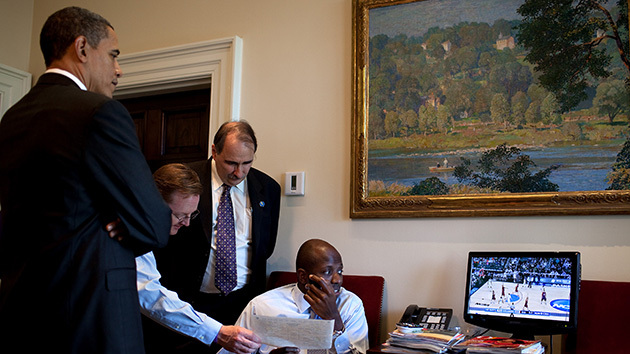 “A homer pick,” Obama calls it. But a president nearing the end of his second term is surely entitled. From GOP majority whip Kevin McCarthy ripping the president in 2013 for filling out brackets without having submitted a budget to Congress, to a Fox News chyron two years ago that read OBAMA PICKS NCAA BRACKET WHILE PUTIN DECLARES CRIMEA AS PART OF RUSSIA, political opponents have had their own take on the presidential brackets. But last year many Republicans seemed to call a cease-fire, whether talking about the tourney or talking up some local team. Senators Rob Portman of Ohio, Rand Paul of Kentucky and Marco Rubio of Florida all weighed in with their opinions. Then presidential candidate Jeb Bush pushed out a full bracket on social media. Setting up in the Rotunda of the House, Katz and ABC News’s Rick Klein got such members of Congress as Cathy McMorris-Rogers of Washington and Paul Ryan of Wisconsin to wave the flags of their local schools, the Zags and the Badgers, respectively. In 2015 even Mitt Romney entered the ESPN Tournament Challenge. As a candidate in 2012, he had declined a request to fill out a draw sheet, protesting that,"I’m not plugged in well enough.” Yet last March Romney finished in the 99.9th percentile, correctly picking six of the Elite Eight and all three games at the Final Four. For his part, Obama placed in the 39.5th percentile last year, proving what anyone who has watched some dilettante co-worker win the office pool knows well—that being “plugged in” is overrated. College basketball has played a huge role in Obama's political life even beyond the annual bracket ritual. In his first campaign Obama used the game to bond with voters in North Carolina and Indiana, scrimmaging with the Tar Heel men and participating in 3-on-3 tournaments with student volunteers around the Hoosier State. After making a basketball lover's case to basketball-loving people, he won primaries in both places—and in the general election they wound up being the two reddest states he flipped to blue. Or they want to if that interest is sincere. Basketball worked for Obama because the game had been marbled through his life, as golf had been through Dwight Eisenhower’s and football through Gerald Ford’s. Let that be advice to a successor: Real fans can easily tell sports “enthusiasm” when it’s something a political consultant has whispered in a politician’s ear.